Sea Spray Boutique Hotel is located on one of the best Brighton seafront squares, bringing you a refreshing new slant on the Boutique Hotel concept. Sixteen individually styled and designed themed boutique bedrooms, genuinely helpful and professional service, thoughtful little extras, and fabulous great value offers - plus one of the best award-winning hotel breakfasts in Brighton - that you can even have in bed. 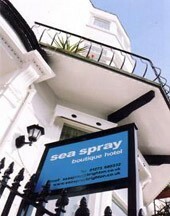 If it is something a little special you are looking for - different from the usual Brighton guesthouse or hotel - then look no further than Sea Spray. It really is a beautiful little hotel and the unique themed rooms put a bit of fun back into the usual hotel experience. Rooms vary in price depending on what you go for but the full list of rooms and prices can be found on their website. 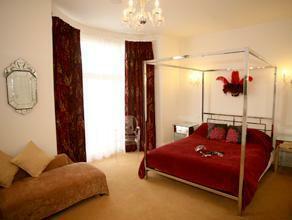 I stayed in Little Venice on my stay, a gorgeous room with a huge bed and a black velvet chaise longue. Marvel at the crushed red velvet curtains and decadent feathered Venetian mask. This room has a king-size bed, new contemporary tiled ensuite shower and toilet, CD player (with shower room speakers which are brilliant to wake you up in the morning), flat screen TV with Freeview, ipod dock, well-stocked minibar, bath robes, hair dryer and hot beverage facility - what more could you want from a hotel? Scenically placed on the New Steine - just on the Kemptown side of Brighton - parking may not be convenient, but the beach and bars are just a pebble's throw away. Overseas guests often choose to stay in the Dali room (the Spanish artist being a particular passion of the owner) when they're visiting a Dali exhibition in London, for example, while those staying in one of the Moroccan rooms might ask staff to recommend somewhere fittingly North African to eat. You get the idea. Definitely worth the price and the experience. 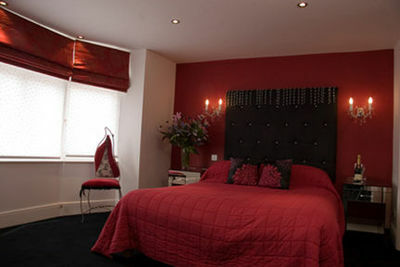 Single rooms from £40, doubles from £95, suites from £130. New York Penthouse from £200. A two-night minimum stay at weekends applies.